Big Question: Was the Sochi Olympics a Dystopian Reality?? 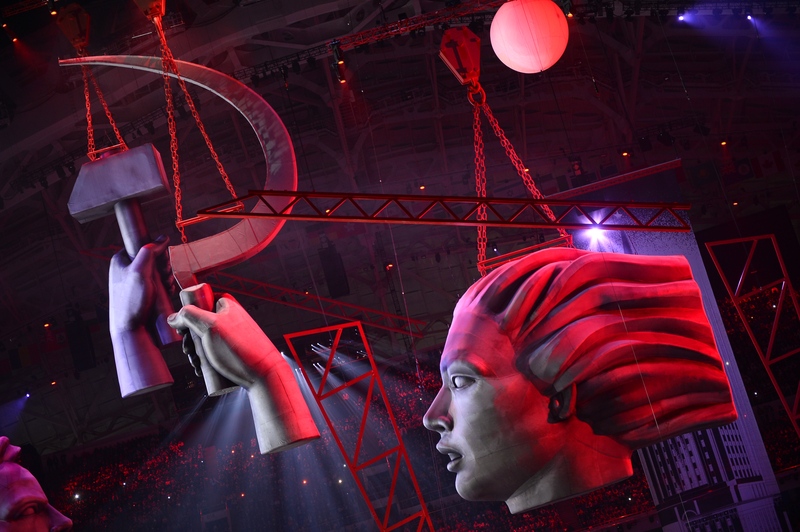 Do you think that the Sochi Olympics resembled a dystopia? Does this visual seem a little dark for an Olympic Opening ceremony? The spirit of the Olympics is a celebration of countries coming together to celebrate teamwork, sportsmanship, tolerance, peace and harmony. Sounds almost like a perfect world, perhaps a utopian world where everyone comes together in harmony and respect for 10 days. Notice what Olympic IOC President, Thomas Bach said “by living together under one roof in the Olympic Village (the athletes had sent) a powerful message from Sochi to the world: the message of a society of peace, tolerance and respect. “I appeal to everybody implicated in confrontation, oppression or violence: act on this Olympic message of dialogue and peace.” He then thanked Russia and its president Vladimir Putin for “delivering what you promised”. The question now is… Did Vladimir truly “deliver what he promised”?? Would all Russians agree?? 2. Take a look at another video also taken during the Olympics in Sochi…. Same video as above with no News story explanation about human rights. Would you say that the ideals of the Olympics are being upheld? Russian All girl band speak out against Russian’s president, Vlamir Putin and human right violations. 3. Read the following aloud, and include on data projector or or paper. "Putin will teach you to love the motherland"
A performance-art collective, made up of a loose grouping of feminists, has called for a boycott of the Sochi Olympics, arguing that Putin has exceeded his authority and is restricting human rights. The bands members, Nadezhda Tolokonnikova and Maria Alekhina spent nearly two years in prison on charges of hooliganism for their protest in Moscow's main cathedral in 2012. The band’s video, called "Putin will teach you how to love the motherland", was posted on YouTube and features a song and footage of the band's protests. "Sochi locked down/the Olympus under surveillance/Of guns and crowds of cops." Why would people fear a crackdown on protesting in Russia, once the world is no longer watching?? Read and discuss briefly in class, then get to the Live Chat… Explore the question: Was the Sochi Olympics a dystopian reality?? What are some of the weird or dystopian like issues that visitors to Sochi observed?